Welcome to Bracknell’s underwater world! 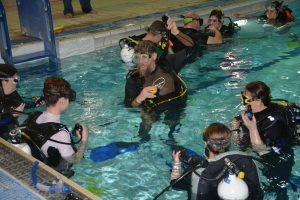 Bracknell Sub Aqua Club welcomes trainee or qualified scuba divers. We can offer a full training programme of BSAC Diving and Snorkelling Courses that enables divers to progress through a framework of qualifications at their own pace. Training will be delivered by qualified BSAC instructors within the familiar, friendly confines of the club. Members do not pay tuition fees for in-house training courses although there is usually a small fee to BSAC for training manuals and logbooks. Whatever your underwater interests are, our Training Officer will always be happy to discuss your preferred options. When you begin training, you will join a group for dive theory lectures. For initial pool activities we pair students up, usually with the same instructor. This means that you can get individual attention, learning at a pace that suits you. Your diving safety, confidence and competence is our goal. Having completed the initial Ocean Diver training you may wish to continue, the natural progression being Sports diver followed by Dive Leader and then Advanced Diver. Of possible interest to any level of diver there are a number of Skill Development Courses, many of which can be run in house. See progress your diving for full list and visit our calendar to see what is coming up. As you progress with your diving you may be interested in exploring more technical diving options. Listed below are a selection, many of which can be taught by our in house instructors. Deeper diving on specialist breathing gases – currently the club record is in excess of 150m using a blend of Nitrogen, Oxygen and Helium. Sports Mixed Gas and Accelerated Decompression Procedures skills development courses. Rebreather diving – we have many members diving closed circuit rebreathers and can arrange try dives on this specialist equipment. Wreck diving – the UK is one of the greatest wreck diving sites in the world and Wreck Appreciation training is available. Photography and videography – Bracknell Sub Aqua Club is home to some exceptionally gifted people who are keen to share their skills and compare the results at the club’s annual photographic competition. Whilst we run a wide range of courses within our club, there are some we cannot support or may not be running at a time that suits you. Each BSAC region has its own training team running courses which full BSAC diving members may attend as long as they satisfy the minimum entry requirements.